impossible to solve through traditional policy reforms; how international refugees should receive health care; and whether policy reform lessons from other countries can be adapted and applied to transform another country's health system. 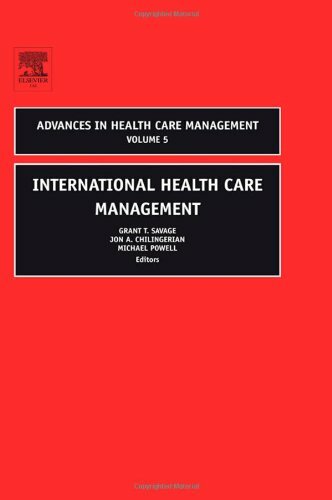 The third and final section on performance and management addresses issues such as whether the quality of care can be managed at the hospital level, how human resource management can be benchmarked within and across health care organizations, how health care informatics and telemedicine can improve the continuity of care, and whether different ways of accessing care within health systems can be systemically compared and improved. Authors from Australia, Chile, Finland, France, Germany, Greece, South Africa, Taiwan, the United Kingdom, and the United States of America contributed to this volume. They explore the delivery and organization of care in health systems from Africa, Asia, Australia, Europe, North America, and South America, encompassing more than 20countries in their comparisons. The papers included in this volume were only accepted following a rigorous peer review process. Each paper, whether solicited or responding to our open call, went through a double-blind review and revision process. The result is a select collection of outstanding papers. The author was a Navy fighter pilot, sailor, skier, and executive who built and administered hospitals. For the last twenty years, his concerns have been about human relationships and how the importance given to the individual has superseded the importance of relationships, with self-love trumping our love of others. This resulted in many years of thought and a decade of researching and writing this book. To find the way of love is to explore and reexamine the purpose of our existence. Michael Powell (1905-90) was one of Britain's foremost directors and a three-time Academy Award nominee for The Red Shoes, 49th Parallel, and One of Our Aircraft Is Missing.